WHAT ACTIVITIES MAKE POLICE STOP AND QUESTION PARK USERS? Almost two years ago, a CELOS freedom of information request asked for all police incident reports over 4 years at Dufferin Grove Park (minus names). Until recently, no one found time to analyze the data. 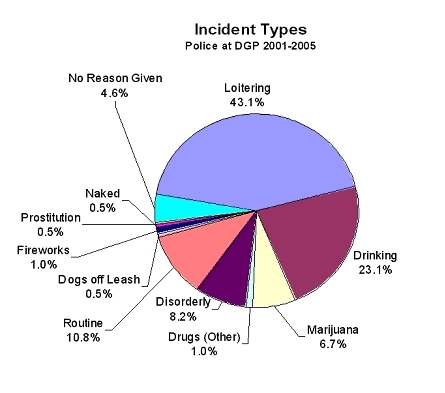 Now CELOS researcher Corey Chivers has gone through all the reports and made a pie chart to show what makes police question park users (notably 43% of the activity regarding loitering). This seems to suggest the need for some follow-up information, but first the chart has been sent to Fourteen Division Superintendent Ruth White, asking for help with clarification. One reason the Parks budget is stretched is that somewhere around $1 million has gone into hiring new Parks by-law officers in the past few years. At Dufferin Grove Park, the officers have sorted through trash bags looking for envelopes to trace illegal household garbage. They have cautioned farmers about parking in the park during the farmers’ market (until the market was explained to their supervisor). Most recently, Parks supervisor Peter Leiss sent them to the park on two days of the Labour Day weekend, to make sure that recreation staff had provided campfire groups with pails of water. One unit checking up on another! Surely this would be a good place to cut costs.